I can't believe I made an animated gif. Hollie's going to kill me. I have reached the first milestone that makes me feel like a real business: I bought an ad! During the month of August, you'll be seeing my little animated .gif flashing around Craftster. As a former graphic designer and total art snob, I HATE animated .gifs. Just thinking about it brings to mind images of email forwards from nerdy relatives that contain big eyed blinking puppy dogs or web pages with those god awful rotating traffic barricades indicating that the page is still under construction. ...But with no animation, how on earth would I fit all the things I want to show people into just ONE 125 pixel square? Never happen. I gave in, and now I am making a blinky thing that shows a bunch of yarns and then my logo. Spinning has really made me fully realize how I hate having a day job with the fiery burning passion of a thousand hells. It takes up far too much of my valuable crafting time. I noticed that in the above paragraph, for the first time ever, I put the word "former" in front of "graphic designer" when describing myself. I have clearly spiralled so far into the yarn universe that I consider myself a professional. I wish I could afford to do this full time. I got the wheel last week and I am positively obsessed. How obsessed, you ask? So obsessed that I have actually neglected to crack open Harry Potter and the Halfblood Prince since its arrival yesterday. Previously, Harry Potter topped my obsession list, but not this week. This week, I spin. I've got the hang of the thing, I have some new yarns to add to the store today, and I finally made my copycat version of Colinette Point Five and it is in the kitchen awaiting a dye job. 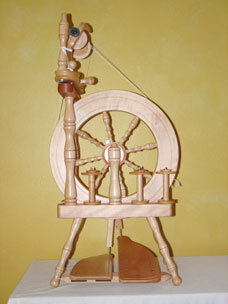 Picked out my spinning wheel! I met with the super nice lady at Fibres 4 Ewe up in Richardson and tried out her selection of Ashford wheels. I picked the Traveller; it's just gorgeous and it will be on it's way to me as soon as I give her my down payment. The more affordable Kiwi was a close runner-up, but didn't have an attached lazy Kate or quill attachment. Plus, it just doesn't *look* like a spinning wheel. My fiance and a few friends have all commented that their only knowledge of spinning wheels is what they've seen in that old Rumplestiltskin movie from when we were kids, and I was ashamed to admit that I was just as ignorant as them until my trip to Fibres 4 Ewe. "How does it work?" they'd ask. "I dunno, I think I have to randomly throw straw at it," I'd reply. Getting hands-on time with each of the different wheels was such a big help. The Traditional was the one that stuck out in my mind at first (touted on the brochure as "Your first wheel!") but the thing just wasn't very impressive in person. Awkward and difficult to pedal the single treadle, and more expensive than the standard double treadle on the one I picked. I am comfortable enough, even with the limited time I had on each of them, to say with confidence that if you are considering getting an Ashford Traditional, don't. Get the Traveller, or a Kiwi if you're looking for a great bargain without sacrificing quality. I also bought my first batch of "good stuff" for spinning with. 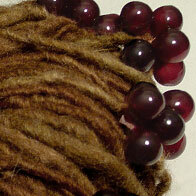 Black and maroon merino, much softer and silkier than the generic wool I have been using so far. The cheap stuff I've been using has treated me very well so far; I almost feel like I'm cheating on it.